Prepare for the Apocalypse! Entertainment Weekly has a new look at the stars of Mad Max: Fury Road. 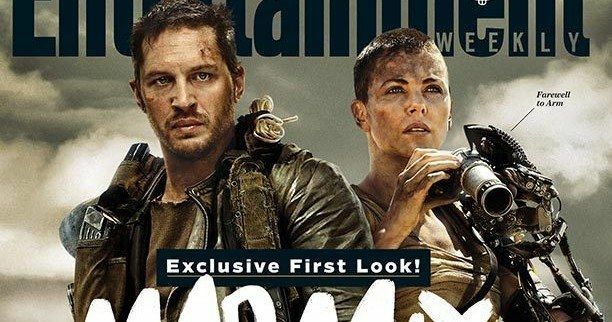 Tom Hardy and Charlize Theron appear in character on the cover of a doomsday themed issue that will be on newsstands this week. Take a look, and then read on for more of what we can expect from director George Miller's reboot of the iconic franchise. It's been thirty-five years since director George Miller visited the apocalyptic waistland of 1979's Mad Max franchise, which spawned the sequels Mad Max 2: The Road Warrior in 1982 and Mad Max Beyond Thunderdome in 1985. He now returns with a new cast as he enters an amped-up world of chaos and carnage with Tom Hardy taking over the iconic role of Max perfected and originated by Mel Gibson. ""It was mental in a brilliant way. You have no concrete, no coffee shops. We were in the middle of a sandpit." Director George Miller offers some insight into the story we'll see play out on the big screen when Mad Max: Fury Road opens summer 2015. "I wanted to tell a linear story-a chase that starts as the movie begins and continues for 110 minutes. In this crucible of very intense action, the characters are revealed."